On June 18, 2008, China and Japan agreed to jointly develop part of natural gas fields in the East China Sea. Following this formal announcement of the agreement, on the same day the Japanese newspaper Yomiuri Shimbun reported that Prime Minister Yasuo Fukuda decided to attend the opening ceremony of the Beijing Olympics. According to the Yomiuri Shimbun , at a press conference last Wednesday, foreign Minister Masahiko Komura emphasized the significance of the agreement reached after long years of dispute with China. “The agreement brings benefits to both Japan and China,” he said. However, the agreement was sharply criticized by Chinese Internet users and the Hong Kong media immediately after its announcement—they criticized the Chinese communist authorities for betraying the national interests, humiliating the nation and forfeiting its sovereignty. The agreement allows Japan to invest in and share the profits in the disputed areas of the East China Sea, including the involvement in the Chunxiao field, which Japan calls Shirakaba. The territorial dispute in the East China Sea is centered on jurisdictional entitlements to the potentially vast hydrocarbon resources that lie beneath. Sino-Japanese tensions over the dispute have been high since August 2003 when Chinese oil company CNOOC entered into a partnership with Unocal and Royal Dutch/Shell to produce natural gas at the Chunxiao gas field located a few kilometers from the Japanese claimed “median line” in the East China Sea. Japan divides the East China Sea in half along this line which marks the limits of both parties' Exclusive Economic Zones (EEZ) as outlined under the 1982 UN Law of the Sea (UNCLOS III). China claims jurisdiction over the entire East China Sea based on the natural prolongation of its continental shelf, a method of maritime delimitation also recognized under UNCLOS III. This difference is fundamental to the gas dispute, as China claims that Japan has no right to protest its Chunxiao operations because the production sites are in the Chinese EEZ under either interpretation. The Japanese side is concerned that the Chunxiao field may extend into the Japanese EEZ, thereby costing Japan valuable resources. Yasuo Fukuda, during Hu's state visit to Japan, was noncommittal on the issue of attendance at the Olympic opening ceremony, but with the agreement on the East China Sea issue signed, Fukuda immediately said that he would attend the opening ceremony. Fukuda would be the first prime minister to attend the opening ceremony since the late Noboru Takeshita went to the Seoul Olympics in 1988. After the Chinese authorities announced the agreement, patriotic people in China expressed their dissatisfaction. Several well-known websites published criticism of this policy from some Internet users. The online criticism opposing the agreement include calling Chinese officials “traitors” for allowing Japan to invest in China's Chunxiao gas field, which is in the area of the East China Sea that Tokyo does not claim. Hong Kong's Ming Pao Daily published an article saying that the Chinese authorities must make it clear to the Chinese people that the Chunxiao gas field is within Chinese territory, so why let the Japanese companies jointly develop it? Even in terms of common commercial principles, China should show the Chinese people a fair commercial contract, with China's sovereignty embodied in the East China Sea. 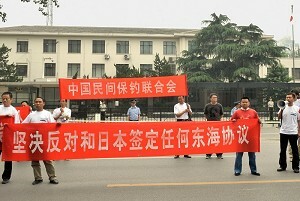 On the afternoon of June 18, 2008, about 20 members of the China Federation for Defending the Diaoyu Islands (CFDDI), held a demonstration outside the Japanese Embassy in Beijing protesting against the agreement. Beijing public security arranged for more than 40 police on the protesting scene, but they only watched and did not stop the demonstration. On June 19, 2008, Chinese vice Foreign Minister Wu Dawei publicly defended the agreement, saying that the two sides had decided to shelve many issues to reach a joint development agreement, and China has not abandoned its claim of sovereignty.